3x Golden Boot & 2x Kicking World All-American will be a Monmouth Hawk! John Coleman made his verbal commitment to play college football at Monmouth University. John Coleman, Class of 2014 standout Kicker from Sparta HS gave his verbal commitment to play 4 years of college football on full scholarship at Monmouth University (D1AA) in West Long Branch, NJ. He had one other offer from Wagner College and 4 other serious interests from FBS & FCS schools, but knew Monmouth was the right fit and did not delay in making his decision! John intends to major in Business and has a great shot at starting right away as a field goal & kickoff specialist. He will make it all official on (NSD) when he signs his letter of intent and officially becomes a Hawk. We are EXTREMELY proud of John because he’s come through our NJ camps over the past 3 consecutive years and followed the process to become successful. He and his family have trusted Kicking World to help teach him the correct fundamentals & technique to maximize his on-field kicking performance. What he learned at our camps over the years inevitably helped prepare him for his standout record breaking senior season. He’s a true inspiration to all the younger specialists out there and many kids at our NJ camps look up to him. 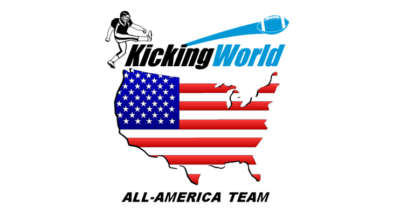 John will become just our third (alum) student kicking coach and serve as a guest instructor at select Kicking World camps in the near future. John, we wish you much success in all you do and will be rooting for you in college & beyond! We will be posting a fun interview between Coach Brent & John Coleman on National Signing Day on our Blog.